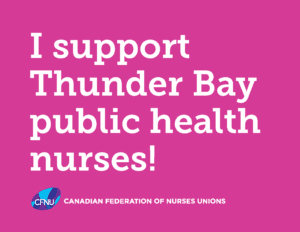 THUNDER BAY – Public Health Nurses working for Thunder Bay District Health Unit will be on the picket lines at 7:30 a.m. today. 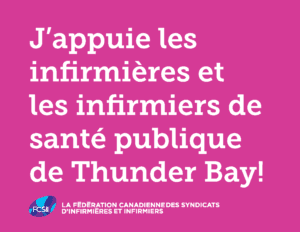 “Unfortunately, a long day of mediation failed to result in a respectful, fair contract offer and our dedicated Public Health Nurses have been forced to take strike action,” said Ontario Nurses’ Association (ONA) President Vicki McKenna, RN. The 58 ONA members had three days of negotiations, two days of conciliation and one day of mediation with this employer. They voted to reject the employer’s final offer last night. These nurses are the lowest-paid in the province and have been working without a contract for close to two years. Read more from ONA’s Media Release.